Tibet has long been on my wish-list. There is a sense of mysteriousness about the place; the restricted tourism, inaccessibility, altitude, previous political instability and rigorous religious practice. Added to that, foreigners have apply to various permits and be accompanies by a tour guide throughout their stay. Good thing I’m a HK citizen then - Chinese permit cards allows absolute freedom in the autonomous region, well, as much freedom as the Chinese government grants. From the plane, the view of the Himalayas snowy peaks piercing through the thin layer of cotton-like clouds, followed by the endless stretch of undulating mountains; it was breath-taking. First thing we found out, NyingChi needs 3 days. Then when we tried to buy our tickets for Potala Palace, we found out there is a reservation system. One needs to pre-book tickets and get a allocated slot the day before visit. More importantly, the altitude sickness or symptoms can be an absolute bummer. While the altitude had no effect on me, Bro suffered mild symptoms of headaches and dizziness, which rendered him helplessly dysfunctional. 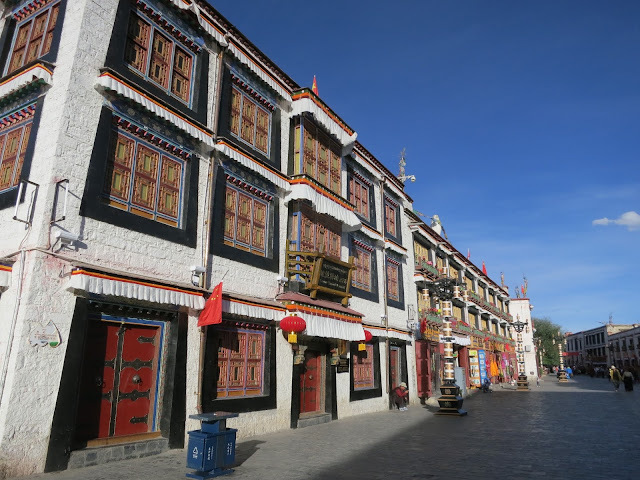 We wandered around the old city area on the first day, but didn’t take much in except for how developed Lhasa is. It was far from what we imagined. There were chain brands, shopping centres, neon lights advertising all kinds of cuisines and, on a positive side, a reliable, developed bus system. 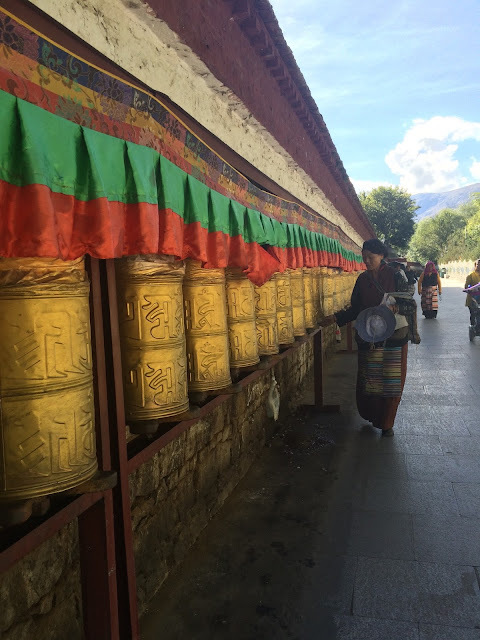 We strolled around the Potala park at the foot of the palace, and followed the religious locals in turning the praying wheels in a clockwise manner surrounding the palace. Back in the days where there was very low literacy rate, the turning of the wheel symbolises the reading of prayers. For the larger wheels, the scribbles represent the face of a god, and therefore we had to take care to turn only at the base of the drum. For dinner we went to a rooftop restaurant called 老渔饭局 (Lau Yu Supperclub), recommended by a bookshop keeper. The food was more Sichuan-focused with a couple of Tibet dishes, quite mediocre but we were granted a killer view of Potala Palace as night began to fall. 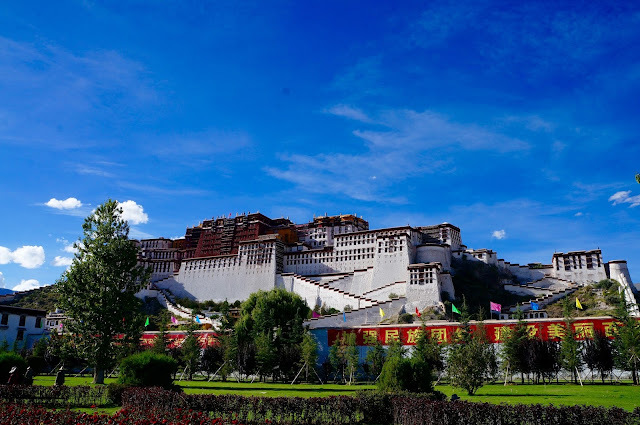 On Day 2, after discovering we couldn’t visit Potala Palace on the same day, we booked our tickets for the following day and hopped on a day tour to Yamdrok Lake. 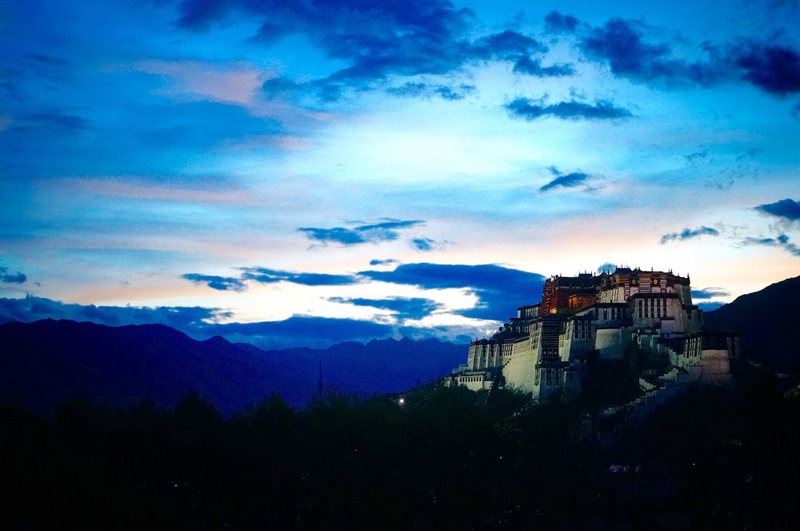 Note, you could only reserve Potala for the following day, with valid identity documents or your guide. It is worth noting that you only need your identity card for reservation, and you pay the entrance fee of 200 yuan (100 yuan between Oct-Feb) on the day of visit. In the case of no-show, the registered persons are black-listed for 7 days. Obviously no one wants to be on a Chinese black-list. The plan re-shuffle also means we had to forgo Namtso Lake, which was a massive disappointment as it was one of our key sights. But between Potala Palace and Namtso Lake, we were told the former is a must-see. Perhaps the 10-hr drive up 5000m to see a lake wasn’t such a great idea when Bro wasn’t in his best form. 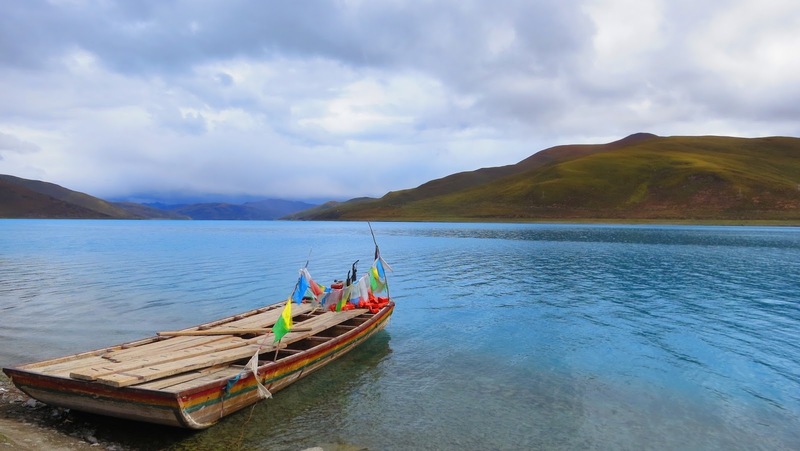 An alternative was to visit Rikaze for 2 days to leave us with a day to Namtso. But we heard that is mostly a shopping tour with few picturesque scenes. 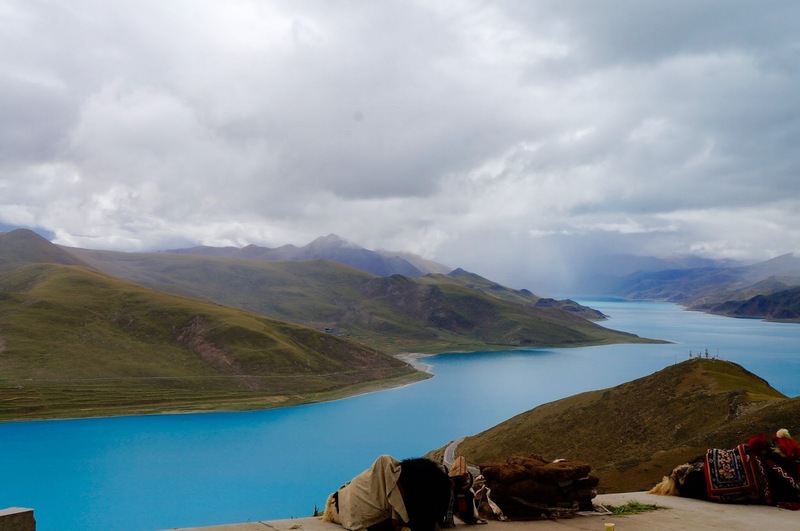 Yamdrok lake was merely a 2.5hr drive from Lhasa. Hoisted at 4440m above sea level, it’s one of the three sacred lakes of Tibet. While we were supposed to be heading to a lower altitude to relieve Bro’s altitude reaction, I forgot to check the altitude of the lake, not to mention the even high ascend over the mountains before reaching the lake… He made it though. The lake had a beautiful turquoise blue despite the grey skies. The lake probably would look even more impressive on a bright blur day, but the haziness added ambience. 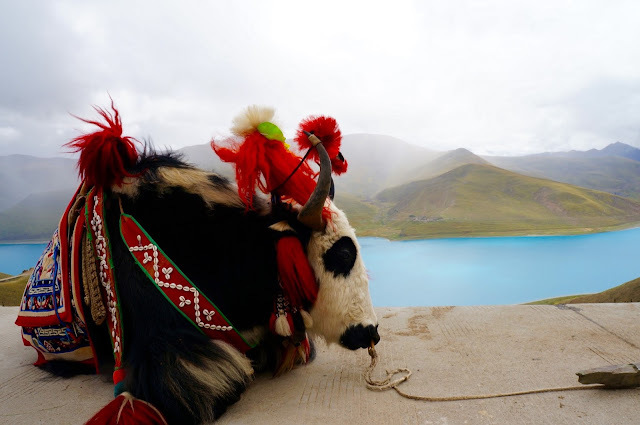 There are various locals with their decorated yaks that charge for photos with them. At the lake, beware of a lady that charges you 5yuan for snapping a photo of the name of the lake inscribed in stone that I’m damn sure she didn’t put up. We ignored her. We tried something called Mo cuisine for dinner, from Chengdu. We were given 2 metal bowls to pick our meat and veg from the fridge, then the kitchen cook it all in one huge pot for us. Pretty good. 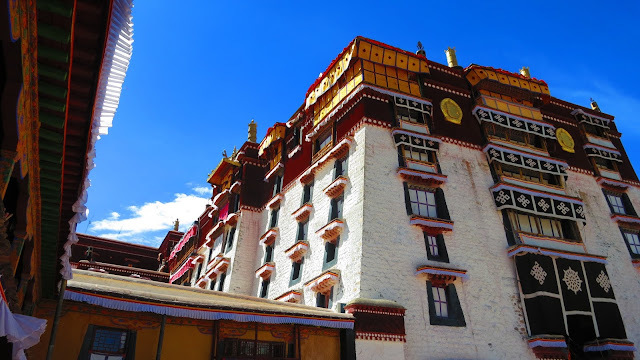 We were booked for 3:40pm to visit Potala Palace on the next day. The ticket grants us admission to the Snow City, which is the area at the foot of the palace, 2 hours before our allocated time. We wandered around the old city of Bakhor streets in the morning as we watched dedicated Tibetans pray around the Jokhang Temple. Some circumambulate the temple clockwise spinning their praying wheel and mumbling prayers; some ran the full kora (praying ritual) repeatedly in front of the temple; a few made their way around the temple while performing the full kora. Feeling adventurous, we entered a local teahouse for a mid-morning break. The teahouses are often clustered by local Tibetans chilling around the low tables covered in colourful rugs. None of them look glamorous as the rooms are dark with lots of flies. I think our entrance startled the Tibetans, but they still welcomed us and helped us with the menu, which was mostly in Tibetan. Originally we wanted to try "butter tea”, but they didn’t have it here. We sat down for a small pot of “sweet tea” (4yuan) and a “beef cake” (2yuan) , which was a savoury fried bread mixed with spring onion and minced beef. We grew to love sweet tea as the milk in the tea was particularly rich and fragrant. Then we made our way to the Potala Palace square, and found another teahouse that served butter tea (10 yuan). It was vile. Imagine dropping a knob of butter AND lard in your breakfast tea - it had a pungent greasy taste to it. We’ll stick to sweet tea. The Potala Palace was nothing like what I had imagined. With the Chinese government influence over the region, the old Tibet authorities and generations of Dalai Lama have been portrayed to be corrupted, violent and inhumane. There are exhibitions dedicated to dishonour the authorities, with old photographs that don’t necessary serve as concrete evidence to their accusations. Then there is another exhibition that emphasised on the brotherhood and supportive relationship between China and Tibet throughout history - propaganda-type messages that Tibet is an inseparable part of China. I read everything with a pinch of salt. We were allowed entry 30mins before our slot. The visiting route is clearly signposted, with texts to explain which chamber, chapel and tomb. It was completely unique, I have never seen anything like it before. No photography inside the palaces. That said I left with a trace of disappointment. 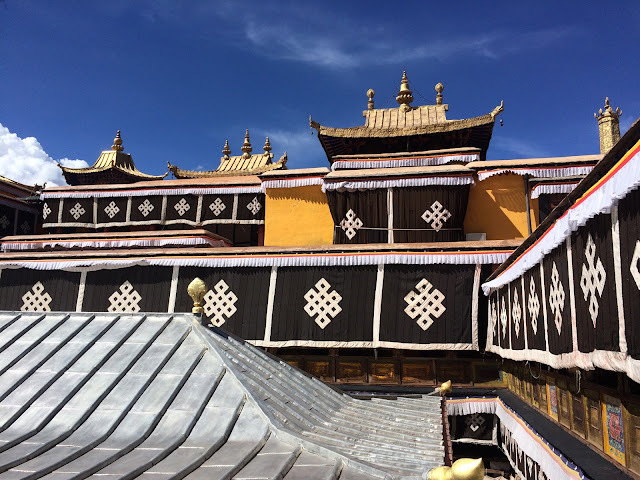 As the most sacred place for the Tibetan Buddhism, we didn’t see monks worshipping or studying, instead there were two monks ‘guarding' each chamber, looking decidedly fed up, chatting with their fellow guards, collecting donation from visitors with zero interest or gratitude. Each room encouraged donation as notes were scattered around the room, even in corners that can’t be reached by visitors. They are hardly painting a good reputation for their religion. Perhaps that was intentional, depending on who is in the drivers seat. 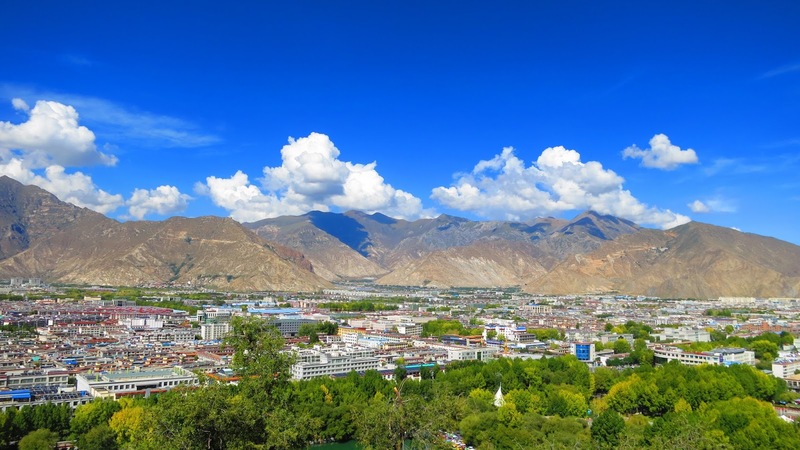 The descend from the palace to the foot of the hill overlooks Lhasa. And we could see how quickly the Chinese government had developed this city by plonking new buildings absolutely everywhere, turning it into just another Chinese city. We headed further out from the city centre to try Stone Pot Chicken, which is a traditional Tibetan dish. We were served a huge chicken broth with a whole chicken in a stone pot over a gas stove, with added beef slices, vegetables and pork meatballs. The chicken soup was infused with Chinese medicine and pork knuckles. which added a gelatinous texture to the broth. It was delicious. The airport bus from Lhasa to Gonggar airport leaves from MinHangJu on Niangre South Road, which is at the street on the left of Potala Palace, between Beijing East and Middle Road. The buses leave when they have more than 18 people and approximately 2.5 hours before each scheduled flight. Visited there last weekend with a group of friends, and had all the fun we could handle. I really like the ambiance at this best boozy brunch nyc place. There's a decent draft beer selection at a reasonable price and the bartenders are good at what they do.